Have you ever baked the chocolate chip cookies off the bag of chocolate chips? The go-to, ever faithful and delicious classic? Or maybe you have your own classic chocolate chip cookie recipe that you always use? Maybe something sentimental from your childhood of coming home to your mother’s freshly baked cookies? So yes, these cookies were voted the New York Times best Chocolate Chip Cookie, and not without reason. They are so much ore rich and flavorful and bold that any other chocolate chip cookies. They will make the recipe off the bag seem like a Chips Ahoy. Unless you like those. Then they make them seem even worse. The secret to why they taste so much better? I honestly have no idea. Maybe it’s the amount of butter and sugar. I’m sure it has something to do with the fact that you refrigerate it for 24 hours before baking them (DO THIS, IT MAKES ALL THE DIFFERENCE), I’m just not sure what that does. I’ll propose a deal: if you can figure out and tell me what the refrigerating does, I’ll bake you a batch of these cookies. And a plus side to the refrigerating is that you can keep the dough in your fridge for as long as you want and just take some out and make a couple of cookies at a time, to fit your needs. Or you can bake them all at once, it’s up to you. Now, as you’ve seen in the pictures, these are not just plain cookies. The pictures are of ice cream sandwiches. One thing that I HIGHLY RECOMMEND doing with these (I mean I'm doing a whole post about it) is to freeze them, sandwich them around cool whip (Or an ice cream of choice, but i love Cool Whip enough to eat a whole container of it plain), line the sides with mini M&M’s (not the normal ones, the mini ones, because everyone knows those are so much better) and then freeze them again before stuffing your face. M&M's are probably some of the most photogenic things in the world. This is only one of the many, many, pictures I took. Other possibilities? 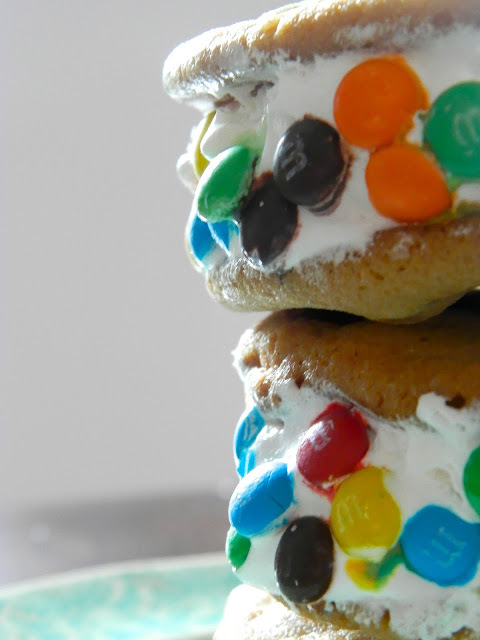 Use M&M’s instead of chocolate chips. Use pretzel M&M’s instead of chocolate chips. Or peanut butter M&M’s. Or coconut. Or all of the above. Or peanut butter chips. Or you could stuff the cookies with other cookies (I recommend using old Girl Scout cookies for such purposes). Or stuff them with Reese’s. The possibilities are endless. You could also always just eat them plain. 5 minutes. Add eggs, one at a time, mixing well after each addition. Stir in the vanilla. Reduce speed to low, add dry ingredients and mix until just combined, 5 to 10 seconds. Drop chocolate pieces in and incorporate them without breaking them. Press plastic wrap against dough and refrigerate for 24 to 36 hours. Dough may be used in batches, and can be refrigerated for up to 72 hours. 5. Freeze cookies for two hours. Spread copious amounts of cool whip onto one and sandwich them together. Roll in M&M's or place them along the side. Freeze for an hour or longer. Then eat!